It was only last week that I wrote about not being able to walk around the garden without running into a spider web. 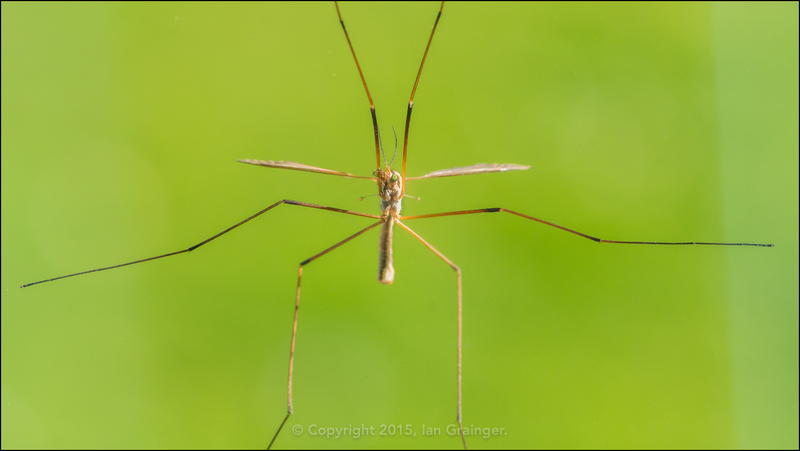 This week there were new obstacles, namely, crane flies. When I was a kid, we called them daddy long legs, and if one got into the house, it used to really freak me out. I'd have to leave the room until either mum or dad ushered the unwanted guest out of a window. There was something about the haphazard way they flew up and down the wall that really got to me. I'm shivering at the very memory of it even now. Fortunately, nowadays I'm not so disturbed by them, although I'd rather they stayed in the garden. The one pictured here was clinging to the outside of a window, so it allowed me to get very close, without flustering me. It's probably the closest I've ever been to a crane fly, and certainly the first time I've admired their wonderful green eyes.